Each year, WordPress provides a year-end review of their hosted websites, and I always enjoy receiving these summaries. Although this information is at hand if you study the stats in detail, it’s kind of interesting to see it collected the way they do. This year, for instance, I had visitors from 82 countries and slightly more than 16,000 views. I posted 152 times in 2013 with a grand total of 589 posts since I began this blog in 2011. I added 358 images this year. When I think back over my blog this year, I don’t feel that I gave it as much attention as I had in past years. But then I consider the numbers, and I don’t feel quite as dismayed. My business really took off this year, and, consequently, time was much harder to come by, especially during the third and fourth quarters. I also realized that I didn’t have as much time for continuing education in 2013, which may have prevented me from taking advantage of those creative prompts I’ve had in the past. Therefore, one of my New Year’s Resolutions is to make more time for my creative self. I’m not sure if daily blog posts are a reality again, but I certainly hope to spend more time on my own projects and visiting other blogs to reconnect with my blogging friends. 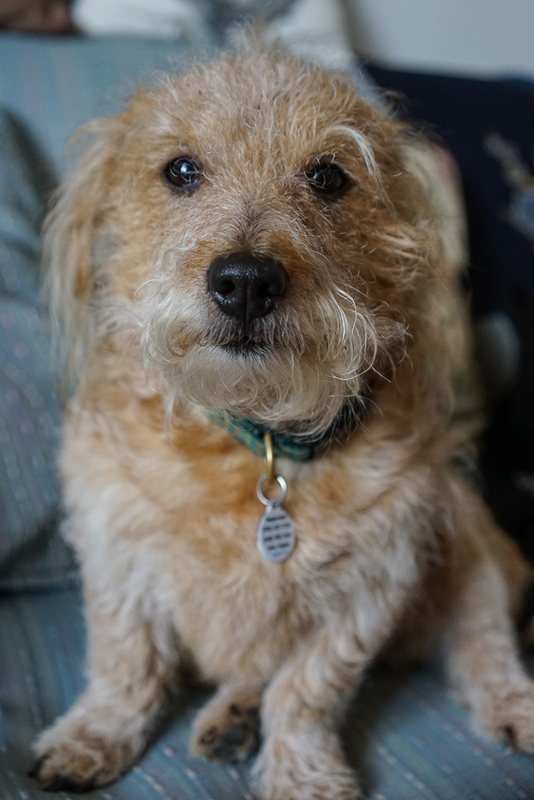 For the past five years, each time I purchase a new camera the first image I make is one of my dog, Peppermint. This Christmas I got a Sony A7, which is my first mirrorless camera. I look forward to learning its finer points and using it for work and play, along with some new lenses that I’ve been eyeing for a few years. Happy New Year to you all, and I hope that 2014 brings an abundance of health and happiness. Thank you for visiting my blog, and I look forward to spending more time with you in the coming year! Did you see the dogs that were made with flowers on the ROSE BOWL PARADE floats this morning? Peppermint would be a perfect “flower dog” as they were made with various kinds of shredded bark with poppy seed noses! Happy to see you are already enjoying the new camera. Yours is the only blog that I subscribe to or read………please continue!!! Awww, Peppermint is so cute! I love your blog and photos, Tricia! I look forward to seeing more photos from your new camera. Happy New Year! Happy, happy 2014, and wishing you joyous days ahead.